Crecenciana Treviño, age 87, of Holland, passed away Thursday, February 15th, 2018 at St. Mary’s Hospital in Grand Rapids. In her last days following a stroke, she was surrounded by loved ones. Crecenciana Robles was born in Mexico to Fernanda and Elidio Robles. She was born on September 14, 1930. She met and married her soul mate Jacobo Treviño in Mexico and moved to Texas. Crecenciana worked alongside her husband for many years as migrant workers traveling between Texas and Michigan. They eventually settled in Holland where they raised their family. She and Jacobo were very involved in their community. They had a special passion for helping migrant families. They would often provide shelter to migrant farming families as they arrived in Holland for the season. 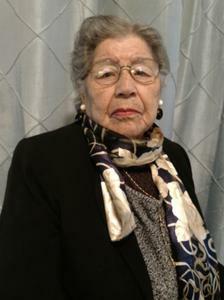 Mrs. Treviño was a devout Catholic where she volunteered often as part of the Guadalupanas. She sang in the choir at St. Francis de Sales church. She loved to crochet, knit and sew, but her love was cooking alongside her husband for many years catering to countless community gatherings including weddings, quinceaneras, and anniversaries. She was especially known for her delicious tamales! Crecenciana is survived by her children, Clemente and Graciela Treviño, Arnulfo and Sylvia Treviño, Frances Bullard, Sylvia Vallejo, Jacobo and Mary Treviño II, Theodoro and Tina Treviño, Yolanda and Roberto Morales, Camila and Jim Looby, Elidio H. Treviño, Jose G. Treviño, Martin and Kim Treviño, Maria del Carmen Treviño, Jose Luis and Bivian Treviño, Sofia and Julian Gonzalez, as well as many grandchildren and great grandchildren. Visitation will be 5:00-8:30P.M., Saturday, February 17, at the Dykstra Funeral Home - Mulder Chapel, 188 West 32nd Street, Holland. A funeral mass will be celebrated 1:00P.M., Tuesday, February 20, at St. Frances de Sales Catholic Church, 171 West 13th Street, Holland, with visitation one hour prior at 12:00P.M. Father Charlie Brown will celebrate the mass. Entombment will take place at Restlawn Memorial Gardens, Holland. In lieu of flowers memorial contributions can be made to St. Frances de Sales Catholic Church, 171 West 13th Street Holland, MI 49423. An online registry is available to sign. Arrangements were made by the Dykstra Funeral Home - Mulder Chapel.